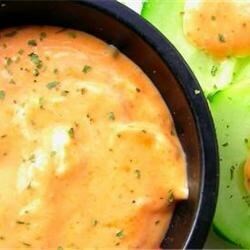 "This cool, creamy and tangy dressing is a spicy pink classic!" In a small bowl, whisk together the mayonnaise, onion, horseradish, Worcestershire, parsley, chili sauce and ketchup. Chill until serving. A simple, tangy salad dressing you make in the blender. Not quite what I expected but still good. Next time I'll increase the amount of chili sauce. This would make an excellent dipping sauce for boiled shrimp! I have to give this 5-stars because it was wonderful even though I used lowfat mayo. I also used this over a shrimp salad. Yummy!!! Just what I needed for my Reuben sandwiches. I only added just a touch of garlic powder and a little fresh ground pepper. Thanks! Yummy! Perfect the way it is. Has a nice bite to it. A little less chili sauce or horseradish would make it taste like your regular store-bought russian dressing.